LOCATED ON THE Murray River, the north-western Vic town of Mildura is known for a number of attractive features - paddle steamers, houseboats, wine-making, fruit-growing and a very agreeable climate, just to name a few. 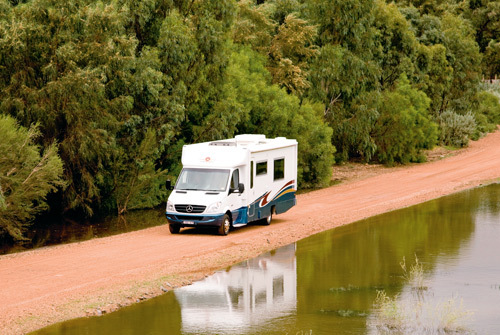 It also happens to be the home of Wirraway Motorhomes. Under the ownership of Rob Tonkin, the company has successfully found a niche in the motorhome market. 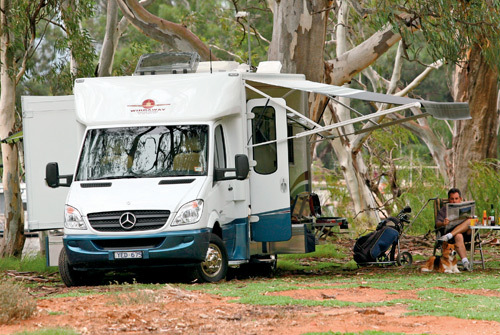 The confidence from this success has led to the development of the latest Wirraway motorhome, the 260SL. The "SL" in the title stands for slide-out - the first out of the Wirraway factory. 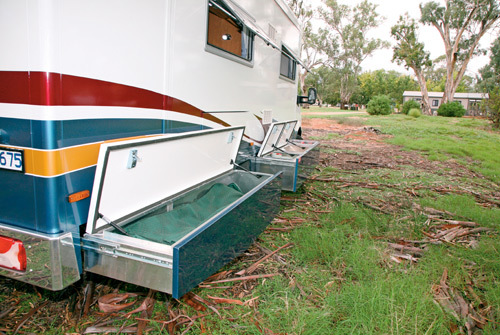 Slide-outs are, admittedly, nothing new in the RV world. And it may be true that not everybody wants one. Nonetheless, the SL is a timely addition to the Wirraway range. The basic Wirraway structure - based on a Mercedes Benz Sprinter cab chassis - remains unchanged. The 516 model is the standard vehicle, while the more powerful 519 is the optional upgrade. Having driven the 516, with its 120kW, 360Nm turbodiesel engine, I have to say that it doesn't lack power. The feature that makes the Benz stand out among its competitors is its super smooth five-speed automatic gearbox. This rig really isn't a hardship to drive, but its GVM of 5250kg means a light rigid licence is required. Its Tare of 4230kg gives a very generous load capacity. Above the Benz chassis, 12mm plywood floor is supported by a box section RHS aluminium frame. Composite styrofoam/fibreglass vacuum-sealed panels form the walls, which includes Seitz double-glazed hopper windows and a door with opening top-half window. Two-pack epoxy paint coats the entire body. 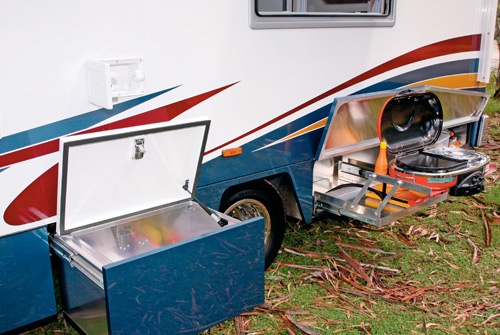 One of the standout features of any Wirraway motorhome is the external storage, and there is plenty here. But instead of conventional bins, large drawers are used. Some have a lid with dust seals and all are operated by remote control. It's a little different to the usual setup, but does mean minimal bending to reach everything, including the gas cylinder and 2kVA generator. The drawers also mean a convenient nearside table for the adjoining slide-out barbecue, which sits in the rear bin. The same bin houses an automatic hose winder, with a food-grade hose and pressure delivery, which allows for washing the motorhome or pumping water to or from another source. The new slide-out introduces a slight problem with the offside bin drawers: they are not externally accessible when the slide-out is open, so selective packing is required. As you would expect, the Wirraway's slide-out introduces considerably more interior space. From front to rear, the slide-out houses a sideways-facing lounge, fridge with microwave above and an east-west queen-size bed. 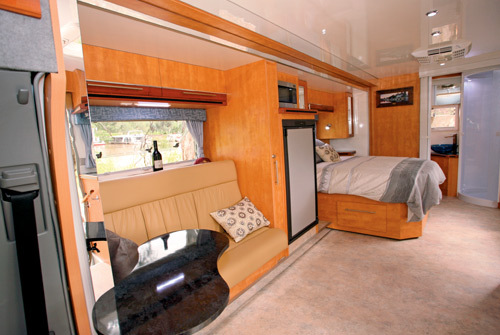 A full-width bathroom sits across the rear of the motorhome and the kitchen fills the front nearside wall. 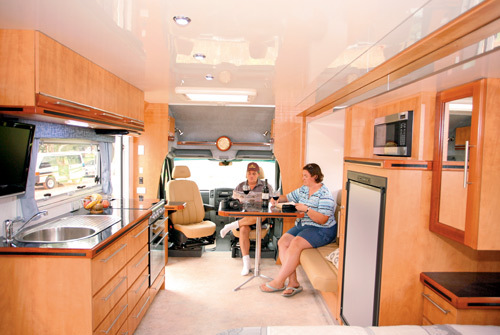 Both driver and passenger seats swivel around and, together with a removable table and the side lounge, make for a neat little dining/lounging area. Tasmanian myrtle timber and laminate is used for all interior cabinetry and the result is very pleasing to the eye. Large roof hatches, generous windows and a glossy white ceiling all contribute to a light, bright interior. The forward seating means you can sit back in comfort and watch the world go by through either the cab or motorhome windows. In addition, the flatscreen TV is mounted such that it can be seen from either the front seats or the rear bed. Wirraway supplies two tables, one conventionally square for proper dining, and an hour glass-shaped option for casual nibbles and drinks. Both can be stored behind the lounge seat. There are small cabinets above the driver's seat on both sides. At first glance, the kitchen may look a little on the small side, but it's actually a generous space. The kitchen bench comes with a Stoves four-burner cooktop, grill and oven, along with a stainless steel sink avec drainer. Eight large drawers make up the storage, along with three overhead lockers. The one thing missing is lots of bench space. An LED-lit wine glass storage area in the adjoining overhead lockers is a nice little extra to the bedroom. It's practical and adds a subtle touch of class. The bed takes up a fair amount of space in the bedroom, but it does feature a full bedhead with side wardrobes and cabinets, nicely split to allow for an extra shelf and the usual overhead lockers. Two large drawers are fitted under the bed, as well as the larger external drawer. 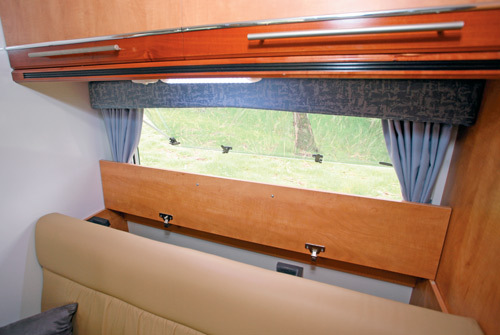 The small cupboard in the nearside rear corner is better utilised as a full-length wall mirror. The circular shower cubicle is quite a common RV feature in Europe, but has never really taken off in Australia (for no discernable reason). This is a shame because they are a welcome point of difference. It may look a bit exposed, but a folding curtain closes off the bathroom for privacy. A Thetford ceramic cassette toilet and small vanity are also fitted into the bathroom. The blue washbasin looks very contemporary and the rear window means you can check the weather while getting yourself ready in the morning. Mirrors are fitted to the doors of the overhead lockers. The Wirraway's electrical system is pleasantly sophisticated. A 25A smart charger, the vehicle alternator and solar panels work to keep the two 120Ah batteries charged up. An EC200 control panel (and accompanying EC325 power supply) controls all of the above items, as well as security lighting, event timing and automatic filling of the drinking water tank. Just set and forget. Lighting throughout is comprised of energy-efficient LEDs. The control panel, along with the hot water switch and Winegard antenna controls, is located above the entry door. In addition, a few other essentials, such as the slide-out switch, electric awning switch and 240V and 12V sockets, are located on the timber panel beside the door. An article of this length does not really do justice to the many features built into this Wirraway 260SL motorhome. 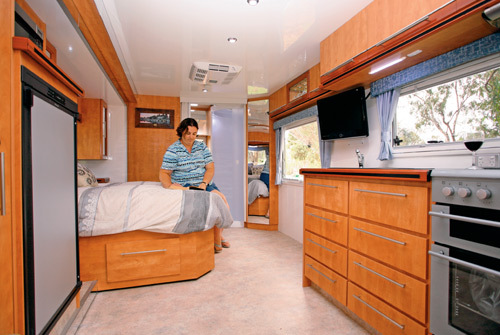 The slide-out adds a new dimension to the Wirraway range: it's something not previously offered that adds considerably to what is already a comfortable and fully featured motorhome. 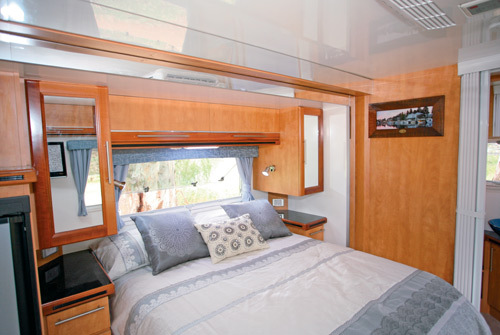 Both inside and out, this Wirraway is a very well-appointed motorhome with plenty of features - and the space to use them. 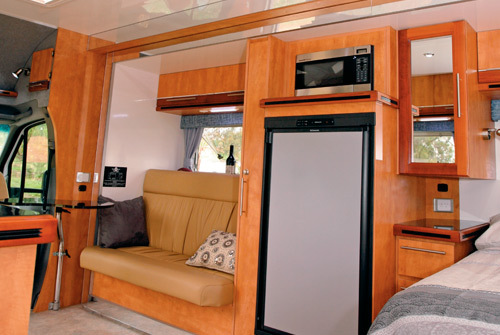 This unit would be a great choice for longer-term, comfortable touring. Source: Caravan World Jun 2011.